It was a beautiful fall day, complete with a nice rain in the afternoon that lasted about an hour. I got my day started with that feeling in my gut that I have way too much to do, and couldn’t figure out what the next thing was. There was a piece I heard on the radio the other day about a researcher that had volunteers manage a made-up financial picture over the course of several months. They had 4 loans of various amounts and interest rates. Most of those participating opted to pay the smaller loans with the lowest interest rate first, because they felt they had too many individual loans to deal with. Even though they would have saved money if they’d have paid off the larger one first with the higher interest rate, they opted for simplicity by paying off the small one first. I understood how they felt. Like so many projects, once you get started, it isn’t so bad. I’m trying to check things off my list for the upcoming hike to the canyon, and one thing I needed to do was get breakfast ready. Alice and I have been making some good granola for most of our married life. We don’t make it too much anymore, but I always do use it for backpacking if I can. It tastes good, and is rich in sugar, oil, nuts, and oats. First comes the dry ingredients. I take a gallon glass jar and fill it about half full with rolled oats, and then add whatever we have in the way of sunflower seeds and various nuts. Then I warm up 1 1/2 cups each of honey and oil, mix well, and start the baking process. The oven is set to about 300 degrees, and the two glass baking dishes with about half the mixture in each go into the oven. The alarm is set for 20 minutes. 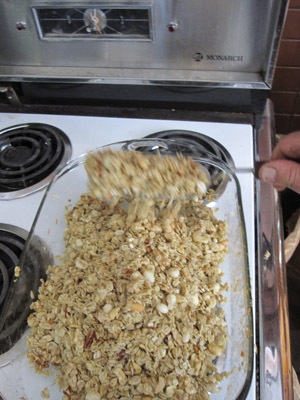 Then every 20 minutes I take the pans out of the oven one at a time and mix the granola with a spatula. This goes on until I take it out and it is starting to get brown on top. Then I set the timer for 10 minutes, then 5, then 4. I keep stirring, each time I take the pans out and swap them from top to bottom shelf. When the granola is uniformly brown throughout, it is done. I then scrape it out of the pans and onto some wax paper on the kitchen counter where it dries and cools. Once cool I break it up and pour it into gallon glass jars, from where it disappears over the course of a few days or weeks. This stuff is really good. I also made a batch of backpacker spaghetti today. This recipe has lots of beans, veggies, whole wheat and other hearty stuff in it. Once done I placed it in the dehydrator where it has been for about 5 hours. Hopefully in another hour I’ll be able to bag it and store it away in the freezer. This will be two supper meals for each of us. Hopefully soon I’ll be able to make the chili and get it dehydrated too. I also put up two batches of cornbread for those suppers when we will need an extra kick. I’ve found the first night I’m usually not too hungry, but towards the end I’d eat my shoe leather if I didn’t need the shoes. Tomorrow I head for Marquette early. I have a full day training session at NMU that is called Wilderness EMS. I’m not sure what it will entail, but I’m sure I’ll learn a lot as I always do. I’m required to do a certain amount of coursework over the course of 2 years so I can keep my first responder certification valid. This particular series of courses will be held over the next 4 days at NMU, and I figured I could devote one day to it. Franco and I had several nice walks today in the lovely fall weather. The one after supper was begun in the bright sunshine, so I didn’t bother putting on my headlamp. Well, I learned I’d better start putting it on every night from now on after supper. The days are really getting shorter quickly. This entry was posted on Wednesday, September 29th, 2010 at 9:26 pm and is filed under Uncategorized. You can follow any responses to this entry through the RSS 2.0 feed. You can leave a response, or trackback from your own site.